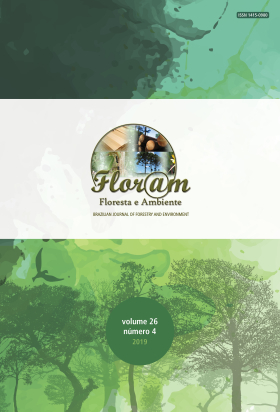 Floresta e Ambiente is a scientific journal, published by the Forest Institute of Universidade Federal Rural do Rio de Janeiro, printed in digital format (ISSN 2179-8087). It has as the main objective disseminate originals articles, review articles or bibliographic updates and short communication, related to Forestry Science. Subject should be are: Forestry, Forest Management, Wood Science and Technology, Forest Products, Forest Biomass and Energy and Conservation of Nature. It will be deemed accepted for publication themes that fall at the forefront of pure and applicable science. FLORAM is a scientific journal of the open access and all of the articles are free to access from its publication. All articles submitted are evaluated at no cost. All the contents of this journal, except where otherwise noted, is licensed under a .
FLORAM is published in continuous flow. The four yearly issues are published in continuous flow and sometimes FLORAM publishes special issues. Influence of Wood Physical Properties on Charcoal from Eucalyptus spp.